So what does one do after the idea is born and the decision is made? After reading a lot of stories & blogs from other travelers, we found out everybody prepares differently. 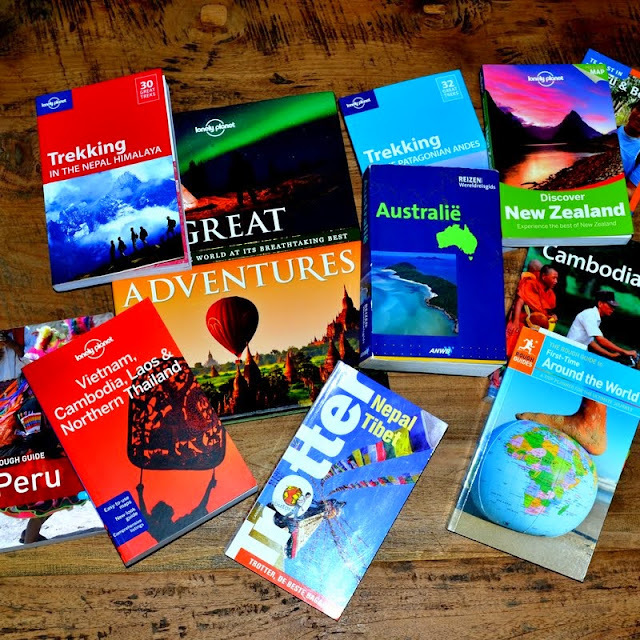 We started with the book: First-Time Around the World (Rough Guide). And since this is our first time, this book was perfect. It describes all key elements to keep in mind in the preparation. We often thought “that’s right, we also have to think about that”. And believe us, there are quite a lot of things to think about: taking care of medical insurance, where to have your mail sent, giving someone a Power of Attorney for all affairs, cancelling all ongoing subscriptions, getting all necessary vaccines, and so on. Reading a lot about traveling, about countries in books, blogs and on the internet. Discussed our budget target & our plan to save as much as possible in the coming months. We told our family, friends and also our bosses & colleagues about our travel plans. Started looking for flights and comparing prices. Understanding flight prices is worse than quantum physics. It defies all logic, but I’ve made it my personal challenge to find the best/cheapest/most efficient way of getting where we want to be! Challenge accepted! First visits to the travel clinic of UZ Ghent. The following months we received all kinds of vaccine-cocktails: Twinrix (Hepatitis A+B), Ixiario (Japanese Encephalitis), Revaxis (Tetanus & Polio), Rabipur (Rabies), Stamaril (Yellow fever), Typhim (Typhoid fever). We will never be sick again! Purchased a credit card better suited for traveling. Cancelled our lease contract of our apartment. Céline is into photography and we decided to buy a new lens with more zoom. Despite what they say about the little flaws of combining a wide range into one lens, the advantages of having only one lens (compact + less weight), convinced us to go for a 16-300mm zoom lens. We bought a new daypack and thus know our total luggage space: 2 backpacks (70+60L) + 2 daypacks (20+30L): We’re wondering how fast we’ll be filling this 180L of space :-). Packing our bags will be a delicate balance, but you’ll find more info about that later on this blog. In june, we could delist a tablet/2-in-1 pc from our “to buy”-list, which we’ll be using for numerous things: this blog of course, to Skype, music, pictures & videos, … This means nearly all our “bigger” costs are covered: our vaccines, lens, tablet, first plane ticket, which leaves only our travel insurance and we’re all set for the major pre-travel expenses. July was a calm month when it came to preparations for the trip, but, we moved out of our apartment end of July and lived for the last 1,5 months with Sebastien (Célines brother). We are very thankful for his hospitality! All lot of our stuff was stored away at several family members and also at an (ex-)colleague who recently moved to her new place and will adopt nearly all our living room furniture. We took only what we still need for this last month. This meant we already started “camping” a bit, but seeing the luxury we have at our temporary home (our own bed, rain shower, new kitchen,…) it certainly feels more like “glamping”. August passed by very quickly: We organised our goodbye party “1001 Nights” and a charity BBQ to raise money for Nepal (see http://everydayisasaturday.be/?p=143). This required a lot of time before and after work to make all this happen, but was totally worth it. We won’t forget that many of the Crosswood friends helped us a lot at the charity BBQ! Thanks! What else? Got my last vaccine shots, had my eyes lasered (byebye lenses & glasses! ), Received an e-reader and bought one extra, bought universal plug, card reader, and other small stuff. As our departure date is approaching, we already had to say goodbye to some people (Mieke & Mattias for example) whom we won’t see again in the next 3, 4, 500 – who knows how many – days.